Sorry the stickers are now completely sold out. They were produced some time ago by Welsh Greens, from whom we received remaining supplies. We may not be able to reprint them. You are welcome to contact us, including ‘NPNT’ in the subject line, to be advised if we get more. This iconic 12cm sticker is exclusively available from Veggies in the UK. A portion of the sales supports the WISE, the World Information Service on Energy and the Stop Hinkley Point Campaign. Stop Hinkley is dedicated to the decommissioning of all the nuclear reactors on the Bristol Channel and the Severn Estuary and is committed to the introduction of greener technologies more appropriate to this millennium. We urge you to click here to send your donation directly to the Stop Hincley C Campaign. Other online sellers online, who might or might not be making their campaign donations to the copyright holders, are selling for about £4 or more +shipping. Sorry these stickers are now sold out (and were only available for addresses in the UK). No Paypal? 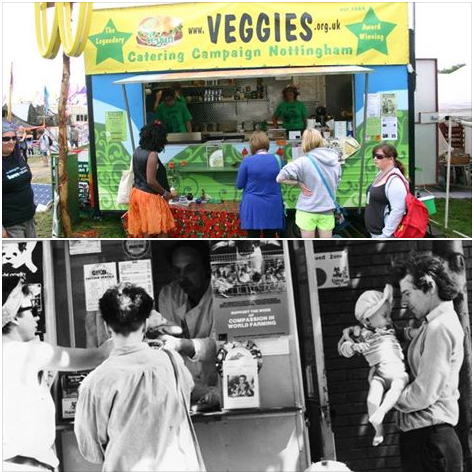 The payment system also accepts credit/debit cards, or post your order to Veggies, 245 Gladstone Street, Nottingham, NG7 6HX (payment with stamps or with hidden cash is welcome). Join the unified show of opposition to new nuclear build and storing radioactive waste at Hinkley, Somerset. The ongoing disaster at Fukushima that shows us that the unexpected and “impossible” CAN happen at any time. “Hinkley C? Somerset Says No” Stickers. The Stop Hinkley Campaign today declared the campaign against the proposals to build a new nuclear station at Hinkley Point C as far from over. All national newspapers have expressed disquiet about these proposals, and today one described the deal with China as “sheer folly”. 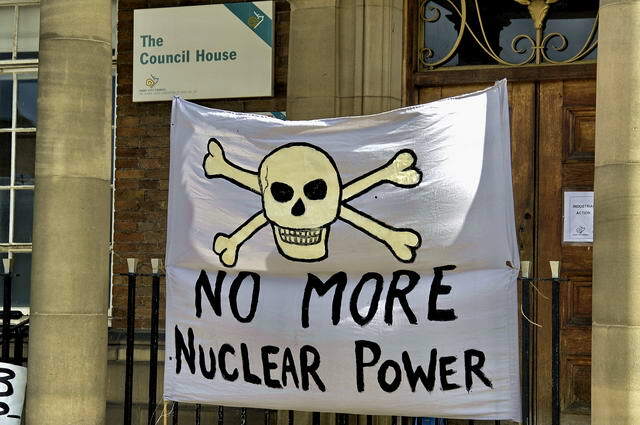 Stop Hinkley spokesperson Roy Pumfrey said “there is still every possibility that this reckless plan will be defeated. This will be the eighth time that EDF Energy has announced that a final investment decision is just around the corner. ”. It is clear, as the Financial Times says that this week’s statements on Hinkley Point do not amount to the final deal. Flawed steel has been identified on the reactor pressure vessel and lid of an identical nuclear reactor being built in Flamanville in Normandy. This could take 12 – 24 months to resolve and no work could start at Hinkley Point until these safety issues are resolved in France. Due to severe financial difficulties and huge levels of debt, the French Government has commenced a restructuring of EDF and Areva NP into a merged company. This will also take some considerable time to achieve, and is a major reason why the UK was so desperate to secure Chinese investment. A reliability clause is likely within the contract. This will be linked in to the prior successful EPR operation being constructed at Flamanville-3 in France. This nuclear reactor project is now years behind schedule and billions over budget in being realised. EDF has asked for a formal three year delay in this project, being it will not be completed until at least 2020, 13 years after construction began. Meanwhile, the former director of strategy for David Cameron, Steve Hilton, has called the deal with China “one of the worst national humiliations”. He said we should impose sanctions on China, rather than “rolling out the red carpet”. Government proposals do not address the carbon debt involved with building nuclear power stations. The construction industry and in particular the production of concrete has a major impact on carbon emissions. There can be no ‘energy security’ from power stations that depend on fuel source, uranium, that is not produced in the UK and which, from all sources, is likely to run out in the forseeable future. When taking into account the legacy that nuclear power leaves for future generations it cannot be economic. What would be the cost over the millenia if the Romans had had nuclear power?The huge cost of building, running and cleaning up after nuclear power stations should more economically, safely and democratically be invested in local micro-generation, ruducing the losses of power transmission, and in promoting the benefits of a less consumer orientated life style and society. When the uranium runs out, or the power stations reach the end of their productive life, when oil has peaked and is in decline, where will the energy be found to keep safe and secure the ever growing legecy of nuclear waste? We are facing possible runaway climate change because of the expansionist policies and practical unsustanabilities of economic growth. We have only one Earth. We have already outgrown it. We cannot endlessly grow our economies, and those of ’emerging’ countries. We must set an example by promoting the satisfaction on living within our means, whilst devoloping policies to reverse economic growth. Nuclear fuel is a limited resource. We do not control it’s supply. As it, and other fuels, run out we cannot guarantee that those countries that have uranium will be forever willing to share it, at any cost. With which countries will be be willing to go to war over nuclear fuel, as we have, and continue to do, for the declining supply of oil? There are more simple and more preductive ways of reducing our impact on the climate. For example the United Nations Food and Agricultural Organisation report that the livestock sector has a major impact, 18%, on emmisions leading to climate change. Reliance on livestock is neither neccessary nor beneficial to human health or that of the environment. It’s demands for land, water and basic food inputs prevents the use of agricultural skills and resources for horticultural techniques, including woodland management, for food and resources, that could reverse climate change. 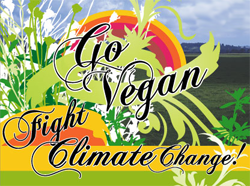 See also Veggies Climate Change Campaigns info. The Smiling Sun Logo was designed in 1975 in Denmark.The logo soon was adopted by the anti- nuclear power movement in dozens of countries. In 1977 the Smiling Sun was trademarked. It became the world wide strongest brand against nuclear power. And still is. All rights to the Smiling Sun logo belong to OOA Fonden, whose task it is to make the logo available for use by the anti nuclear movement world wide and to protect the integrity of the logo by stopping commercial and pro-nuclear infringement. Funds from international sales of Smiling Sun badges and stickers assisted in 1978, and following years, in setting up and operating WISE, the World Information Service on Energy. 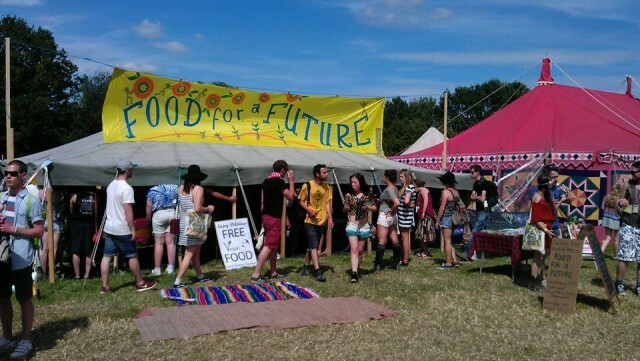 At Veggies we have received supplies from Keep Wales Nuclear Free (aka Big Green Gathering &/or the Green Party &/or the Environment Centre in Swansea). Any profit from selling the Smiling Sun stickers support our own work, campaigning on many environmental and social justice issue, inc Climate Change). Visit http://www.smilingsun.org/ to find out about the history of the Smiling Sun, to understand why the logo is protected and to find out how to become a Smiling Sun licence holder. Window stickers Currently out of stock. 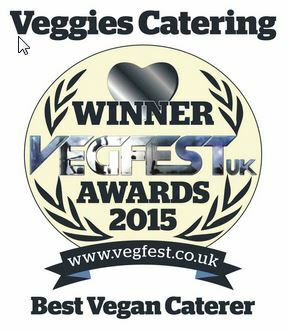 inc p&p and paypal fees ……..
60p per additional Window Sticker ….. Specify in the Paypal Checkout if you require window stickers instead of regular stickers.